Applicable scene: Perfectly decorated with artificial Maple light strings for dinner tables, parties, bar, stages, weddings, bedrooms, night scenes, Bar, festivals, indoor, outdoor, Christmas, Easter and Halloween. Use the ornaments of artificial maple leaf lamps to add beautiful luster to your life. Size:Each rtificial Maple Leaves LED light string length 13.1 Ft (140 cm). LED Quality: 40 LED. Power supply mode:Battery operated with 3 AA batteries(Not including Batrery). Two lighting mode: shiny and bright. Choose different modes to create a warm and romantic atmosphere. Warm white light! Material:Silk cloth and Plastic, color light! Usage:Perfectly decorated with artificial Maple light strings for dinner tables, parties, bar, stages, weddings, bedrooms, night scenes, Bar, festivals, indoor, outdoor, Christmas, Easter and Halloween. 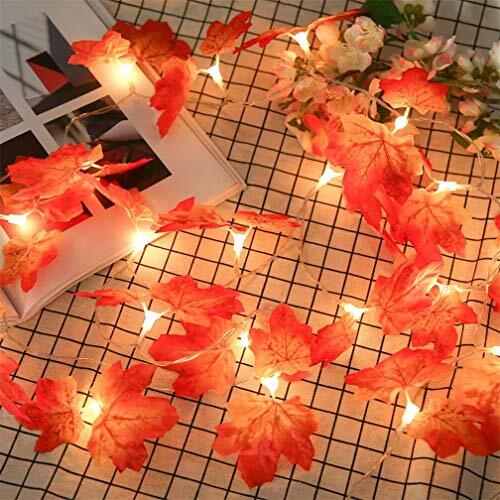 Package: 2 pieces artificial maple leaves light string each order. If you have any questions about this product by Mynse, contact us by completing and submitting the form below. If you are looking for a specif part number, please include it with your message.